It’s Throw Back Thor’s Day (Throwback Thursday on Facebook & #TBT on Twitter, I don’t post consistently every Thursday, but on the days when I’m in scanning mode, I take the time. I started posting because I started scanning all the photos we rescued that the firemen thoroughly doused in putting out the fire that took my home in 2011. I’m still scanning sporadically. It was much too overwhelming to do all at once and there are hundreds of them still to go. I keep going though, hoping to get them all into digital before they’ve faded beyond recall. It’s kind of fun to put some of them into PowerPoint framed and prettied up a bit along with a bit of history – my version of scrapbooking. Having been an Air Force Brat through all of my school years, we moved every three years. I made and lost more friends than many people will ever have. I find pictures of past friends and am amazed that I remember their first names. Fortunately, in 1962 Mom let me buy the school annual for the Pyote Panthers, so I could look up the two fellow brats I’m with in this photo. The Pyote School was an old brick building that contained grades 1-12. There were 10 seniors and 7 juniors, etc…. Mom had chopped my hair again and I hated it, but beauty shop was not in Mom’s lexicon. I was into can-cans and circle skirts which made my 22 inch waist look even smaller. I kept a 23” waist into my 40’s which cost a lot in alterations as nothing off the rack ever fit me. 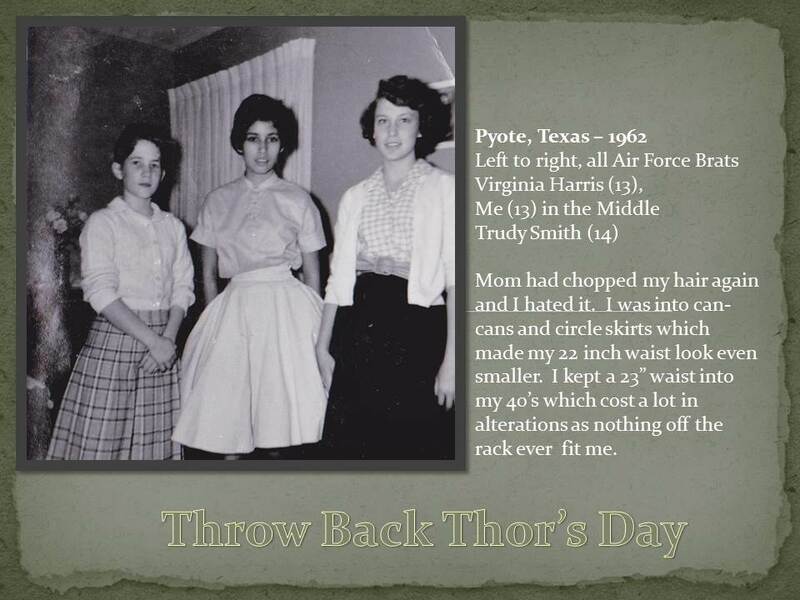 So here’s my throw back for this week from Pyote, Texas 1962. I was scared, but only I knew it. Momma combed my hair into long curls with a comb dipped in cold water – think Shirley Temple. A quick breakfast in the kitchen, and then I walked to the bus stop with the kids I’d just met and barely knew, and took a bus to the first school I’d ever attended. Once there, my new friends left me to go to their classes saying just ask for the principal, so I asked the first grown up I saw. I was determined not to cry, but the butterflies in my stomach made me feel like throwing up my breakfast. I swallowed hard before answering this kind and smiling lady’s question of why my parents weren’t with me. “Momma doesn’t drive and she’s home with my little brother. Daddy went to work at 5 this morning. I have all my papers and stuff, and I’m supposed to give them to the principal.” I handed her the envelope full of information I could not yet read. She took me in hand, and I eventually found myself in a first grade classroom with another young woman introducing me to a class of yet more strangers. Sitting at a desk in a classroom listening to the teacher talk felt somehow right, and at lunch, everyone wanted to know me because I was from Texas. They all seemed to think that all Texans carried guns, rode horses and knew John Wayne personally. The ride home that first day was reflective as I looked out the window at the verdant countryside. I knew that my entire world had changed, and I would never be the same. Some of my new friends were sorry for me, for in their eyes no one cared enough to go with me. Some of my friends thought it was cool that I could go out into the world alone and unafraid. I was a little sad for myself, too, but I was also little bit proud; I knew I was okay alone among strangers. It would stand me in good stead as time and again, I walked into a brand new school and enrolled myself. Although I enrolled in February, with the teacher’s help, I caught up to the rest of the class before school let out for the summer in June. Texas didn’t allow anyone to start school unless they were six the day school started, and as my birthday is in February, I was not in school when we got to England. That was not to last. Daddy came home and said he found out I could go to the base school, regardless. So here it was February; the school year was half over; there was no kindergarten back then for me; I didn’t even know my alphabet. We began after breakfast, skipped lunch, and through tears and threats of no supper either if I didn’t get it all learned that day, I did it. 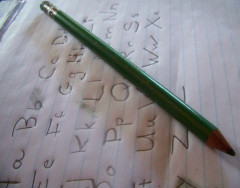 I learned to write and recite my alphabet and numbers 1-100, and spell small words in a day. We went down to the main dining room by 6:30. Sunday we practiced and practiced and practiced some more. The next day was Monday and would be my first day of school. 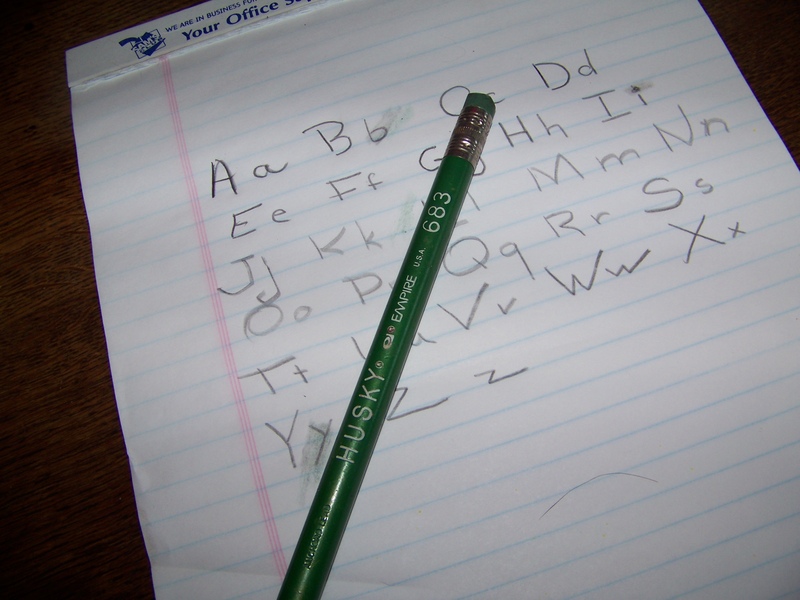 Next: Enrolling myself in first grade. There were some white bread sandwiches on the coffee table. They were butter with cucumber and butter with ham; cut into fours with the crusts neatly trimmed away; and neatly stacked on a beautiful old plate. We devoured them all, and Mom put us too bed. I could hardly sleep, and when she left the room, I crept to the window to look out. As I look back, I know now why I liked that shot in Harry Potter so much. The one where he sits on a large stone window sill looking out through the frosted window of his new home high in the castle. I didn’t need waking up the next morning, I was ready to go before anyone and waiting impatiently at the door. We went down the rickety stairs to the better stairs and found our way to the kitchen, where the maids were scurrying around the long table delivering breakfast to our house mates. At that time, Wadenhoe House was managed by Mrs. Boothroyd (Mrs. B) and with two exceptions, all the rooms and suites were let out to military families. The exceptions were a Scot and a Pole (daddy’s terms). The Scot, when in his cups, would change into kilts and serenade the whole house with his bagpipes whether they liked it or not. The Polish man was quiet and read a lot. Mrs. B introduced us around the table, and asked how we liked our eggs. I watched as the cook cracked these huge eggs into a bowl and beat them with a fork and milk before putting them into the large iron pan on the old wood stove that occupied half the wall at then end of the kitchen. 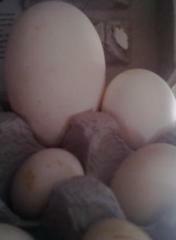 Later when Mom found out they were goose eggs, she never ate them again. Next: Learning the alphabet in one day. It began in San Antonio, Texas. My Mom married Daddy when I was 3, and we all lived in a small apartment in a Mrs. Steele’s comfy old house where the roosters perched on her grand piano and generally made a mess everywhere. We weren’t there long since the minute Daddy married Mom, he got on the waiting list for base housing. Lackland AFB was great. All the families were young, and I suddenly had tons of friends to run and play with until the orders came. I was six and my brother was two when we boarded a ship out of New York bound for England. I was seasick from day one. My most vivid memory is lying on a bunk and staring at a porthole of dark water and trying hard to keep down the saltines I was nibbling on and praying it would be over soon. The crossing took nine days and Daddy had to stay in the men’s quarters, so we only saw him at meal time. We spent only a day in London, and I remember a parade. Mom got a picture of the Queen, well the back of her head. The next afternoon, we got in a black car and headed out of town to a little village called Oundle then on to Northhamptonshire. It’s about 70 plus miles but with no highways, it was well after dark when we arrived at Wadenhoe House. I felt like we were in a scary movie. This huge castle loomed in the night as the fog rolled along the ground all around it and us as we got out of the car. Daddy, ever the practical joker pointed at the head carved above the entrance and said, “That is the ghost of Wadenhoe.” Mother told him to cut it out, but I had to pee too bad to be scared. An old woman, Mrs. B, opened the door and welcomed us; showed us to our flat (English for apartment); told us what time breakfast was served in the kitchen and left.